With "The Flow Of The Flowers", a project carried out between March and May 2012 during a residency in Rabat in collaboration with L’appartement 22, Gabriella Ciancimino analyses the transformation of public space in the space of artistic action. Learning the origami technique from a You-tube video , the artist created the sculpture of paper, applied on some elements of street furniture in the streets of the city. The flower sculptures are created with the photocopies of some pages of text Ecology and Revolutionary Thought (1965) , in which the philosopher Murray Bookchin discusses - among others - the relationship between man and synanthropic vegetation . The flower origami recalls Adonis annua L., which is part of a group of plants considered by man as "dissident weeds", and fought to the point that they are currently in danger of extinction. This vagabond plant, commonly known as "Red Morocco", is native to the Mediterranean, and exploits the passage of man to spread their seeds. To facilitate the spread of the flower conceptually as a symbol of freedom and post resistance, the artist chooses to work during the processions of the dissidents, raising the origami sculptures, loading them with a strong symbolic meaning. Red flower origami "... act as catalysts triggering unexpected reactions, introduce unusual size in the landscape outside of the context which gave rise, at times intimate and subjective ..." (Gilles Clément ). 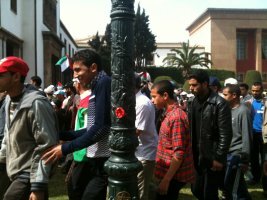 In doing so they attract the attention of protesters and bystanders, and makes possible the dialogue between the artist and the community on the role of art in social change. 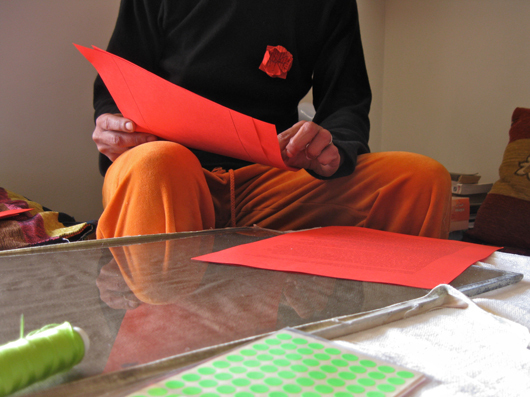 These dialogues have been transcribed by the artist, who has also added pictures and recordings made during the second phase of the project,and the production of a limited set of pins with origami flowers of Adonis annua L.
As already done in "Garlands of Flowers" (Graz, Austria 2012) - a project where the artist starts the reflections continued in "The Flow of Flowers" and "Liberty Flowers" (Rome, Italy, 2012) - the cooperative work stands as an utopian experiment of the theory of social ecology made by Bookchin. It also becomes an experimental study of the social context within which operate. 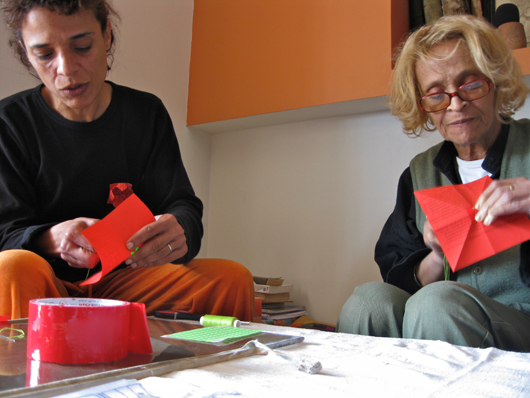 Interventions, collection of documentary material, as well as the formulation of post production, is processed by Gabriella Ciancimino according to the "non metodo" ] -no method – of the philosopher Feyerabend , for which the advancement of knowledge of real data can not be based on the application of established methodological rules. The post-production of this project ends in a composition of drawings and installation. This is the result of a collective work, which outlines the steps involved in creating and transforming the work itself into a piece of art. To the elements created by the artist have to be added those made by the people who worked on the project, both during study and implementation. 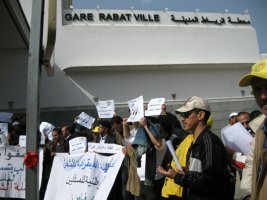 Among the elements of the installation there is a video in which, together with the images that document the speech made during the parade, Gabriella Ciancimino adds frames of audio that recall the protest slogans shouted by the protesters, a sound that has characterized the urban landscape of Rabat for years. On the wall there is a pin with Adonis annua L., made by the Cooperative, a page containing comments by the most famous of Bookchin, Post-Scarcity Anarchism. Ecology and Revolutionary Thought and other essays on the abolition of power (1986), on which the artist highlights some very important steps, and also a botanical illustration and a scientific text on the Adonis annua L. by the PhD agronomist Tina Lino. 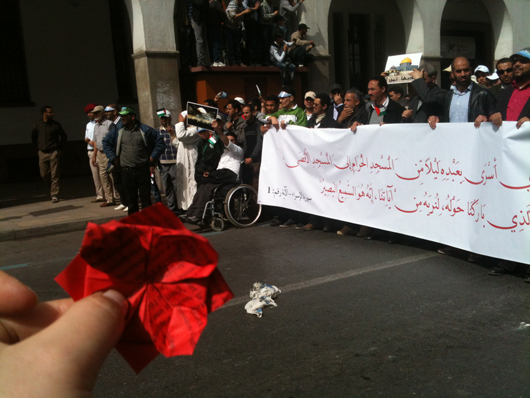 On a table, the artist places the image that depicts a protester in action and the transcription of the talks during the protest with the dissidents. One of these dialogues is a collaboration with the artist Touda Bouanani, who also took part to the Cooperative for the production of the series of numbered pins, some of which are part of the installation and are offered to visitors. Finally to the installation it is added a composition of drawings entitled "Cartoghaphie Directionelle", in which Gabriella Ciancimino retraces some of the most famous posters of historical riots : from those portraying the students of 1968 in Paris, to the revolutions of 2010 in North African countries, focusing the attention on the gestures as symbols of rebellion and resistance. The iconography is also modified by adding the Adonis annua as a post resistance symbol. The question "After the Resistance ? ", at the top of the composition, finds an answer in the choice of working in the Cooperative. 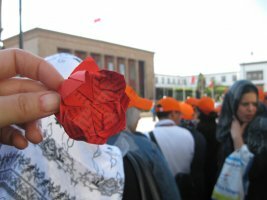 At the bottom, the artist places the magnification of the map of the area of Rabat "studded" Adonis annua origami, and on which it is defined the exact path and the points in which flowers were placed. 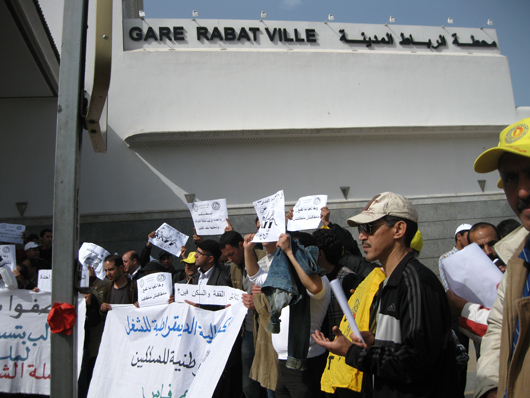 Other maps of Rabat are added to the game of graphic layers of the composition, in which the cartographic forms expand until they disappear, bringing the issues of this project from a local sphere to global one.